Discover how we raise and care for our hens to provide you with the best tasting cage-free, organic eggs around. We raise all of our chickens from 1 day of age. My mom likes to be around when we get the new chicks to make sure that they are well taken care of. I've never quite understood the sentiment, but I guess once a mom, always a mom. When the new chicks arrive, we place them into a barn that has been preheated, kind of like a nursery, so that the chicks are comfortable as soon as they enter the barn. In fact, the entire barn has been designed to create ideal conditions for the new chicks. The feeders and waterers are smaller and lower than those used in the barns for adult birds. The entire area is covered with either shavings or rice hulls so that the new chicks have something to keep them off of cold surfaces. We raise them in these rooms for about 16 weeks and at 16 weeks we move them to a larger area so that they have more room to roam. During this time we are very strict about who is allowed to visit the chicks because their immune system is still developing and we want to make sure that they experience as little stress as possible. It's just like taking care of a newborn baby. We even give them vaccination shots to boost their immunity, just like I had to go get shots when I was a little kid. Once the hens are big enough, we move them into a larger space. Since the barns are open-sided with curtains on the outside to control the light, we use all natural light to illuminate the barn. The sun is able to shine straight in, so the hens are able to bask in the sun. The hen houses also use 100% natural ventilation, except during the cold winter months when the hens need to be protected from the elements. We are lucky that the Petaluma area has such a great climate for raising chickens. In years past it used to be called the "Egg Basket of the World", in large part because the weather conditions were so ideal. 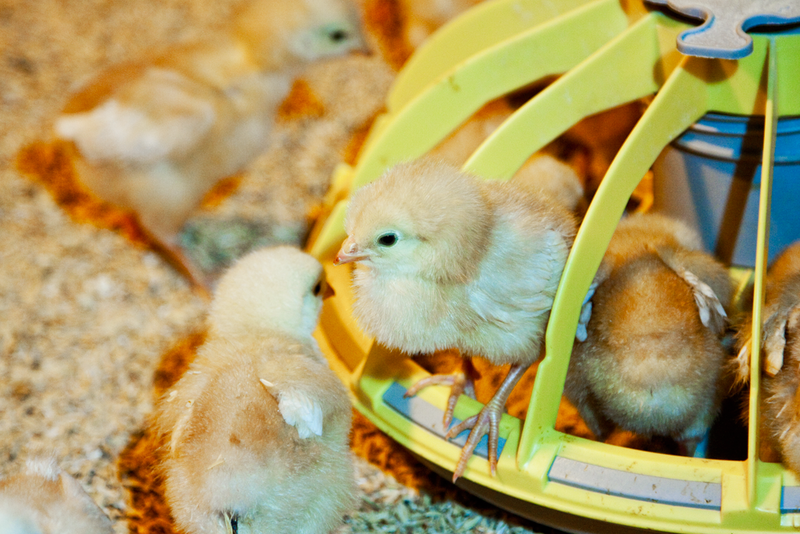 Heaters are not used in the laying barns because adult chickens are full feathered and can handle a bit colder temperature than the young chicks. All of the houses have insulation on top of the roofs to help keep the temperature down inside the buildings during the summer months and warmer during the wintertime. The laying houses include comfortable nests where the hens can lay their eggs in seclusion and darkness, since even hens like a little bit of privacy. Once they lay their eggs, the eggs roll out of their nests to be hand gathered. The laying houses also feature roosting slats where the chickens can hop up and roost, similar to roosting in a tree. The hens always have free access to feed and water, so that they can feast to their heart's desire. Our "Judy's" organic hens get 100% organic feed. Our organic hens are actually certified by Oregon Tilth, which is one of the country's oldest organic certifiers. In fact, we are also the original cage-free egg farm, which means that before anyone was thinking about cage-free, my dad was breaking new ground. Now, of course, there are many copy cats, but my dad was the first one to raise cage-free hens and unlike most other chicken farmers, he has never raised a caged chicken. So what does this all mean? It means that we have been raising our hens the right way, for the longest time, so we have the experience to make sure that our hens and our customers are always happy.